With Republican Ken Cuccinelli and Democrat Terry McAuliffe about even and neither of them popular in a new statewide poll, Libertarian candidate Robert Sarvis is gleaning enough support to potentially affect the Virginia governor's race. Quinnipiac University's poll shows 44 percent of 1,005 likely voters favored McAuliffe, Cuccinelli had 41 percent, and little-known Libertarian Robert Sarvis took 7 percent. Six percent were undecided and 1 percent preferred candidates other than the three specified in the poll. The results for the major party candidates are within the margin of sampling error of plus or minus 3.1 percentage points. They are based on live interviews with voters on land lines and cellphones from Sept. 9-15. The new results show that what had been a clear 6 percentage point lead for McAuliffe in a Quinnipiac survey a month ago has been cut in half. No previous Quinnipiac poll included Sarvis. If Sarvis can hold at 7 percent or increase his share, it would be a milestone for independent or third-party candidates in Virginia gubernatorial elections. The last such candidate, Republican former state Sen. Russ Potts who ran as an independent, got just 2 percent of the vote in 2005. If he can exceed 10 percent, Sarvis could earn official recognition under Virginia law for the Libertarian Party and assure its nominee a spot on the statewide ballot in the next general election. The poll, taken amid an increasing exchange of negative television advertising by major party candidates and allied groups, shows voters view neither man favorably. Thirty-eight percent viewed McAuliffe favorably but the same percentage viewed him unfavorably. Fifty-one percent held an unfavorable opinion of Cuccinelli - 10 percentage points more than in the last poll - while 34 percent saw him favorably. Nor was either major party candidate viewed as a model of virtue. Only 39 percent felt McAuliffe is honest and trustworthy to 42 percent who believe he's not. Thirty-nine percent also believed Cuccinelli to be honest and trustworthy, but 49 percent said he isn't. "Voters are not wild about either man, and that may be one reason why ... Sarvis is running so well,'' said Peter A. Brown, assistant director of the Quinnipiac University Polling Institute. 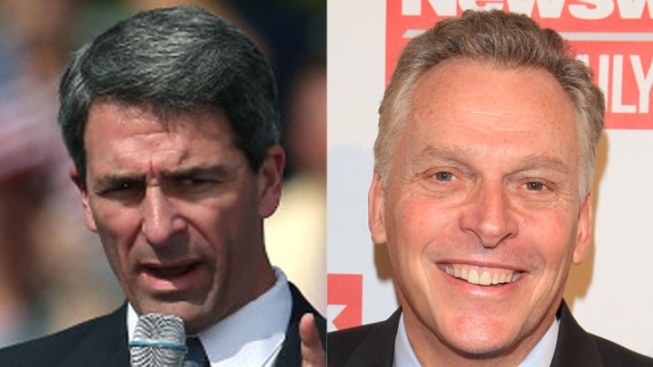 Cuccinelli, the current attorney general, got the upper hand over McAuliffe on experience, with 58 percent saying he has the background to be governor to 47 percent who felt McAuliffe has the right experience. Yet when asked whether they approved or disapproved of Cuccinelli's performance as attorney general, 42 percent approved and 49 percent disapproved. How Sarvis' candidacy might influence the election's outcome is not clear from the polling, Brown said. The influence of third-party candidates tends to ebb as election day nears, he said, and 38 percent of those who support Sarvis also said there's a good chance they'd later change their minds. Three percent of Republican respondents supported Sarvis as did 2 percent who said they were Democrats. Among independents, however, 14 percent chose Sarvis. Unaffiliated voters are clearly the wild card, with McAuliffe and Cuccinelli claiming 37 percent apiece among independents. Sarvis' healthy bloc of independent support makes it even wilder. "Since there are more people in Virginia who now consider themselves Democrats than Republicans, logic says that Cuccinelli needs a solid margin among independent voters. Instead, those voters are divided,'' Brown said. Sarvis' greatest obstacle is his lack of recognition by voters. Eighty-five percent said they hadn't heard enough about the 36-year-old Harvard- and Cambridge-educated mathematician with a law license and an economics degree. And with only $19,109 in the bank as of Labor Day, there's little his campaign can to do make him better known. Candidates in down-ticket races also struggled with name recognition. Seventy-two percent never heard of Republican lieutenant governor candidate E.W. Jackson while 87 percent never heard of his Democratic opponent, state Sen. Ralph Northam. Eighty-eight percent considered the Democratic attorney general nominee, state Sen. Mark Herring, an unknown, and 79 percent didn't know his GOP foe, state Sen. Mark Obenshain.